A liquid-filled capsule. (Bloomberg photo by Ariana Lindquist). That data offers a new window into patients’ health and behavior, Greeno said, allowing doctors to remotely monitor someone’s heart rate, activity level and sleep cycle. 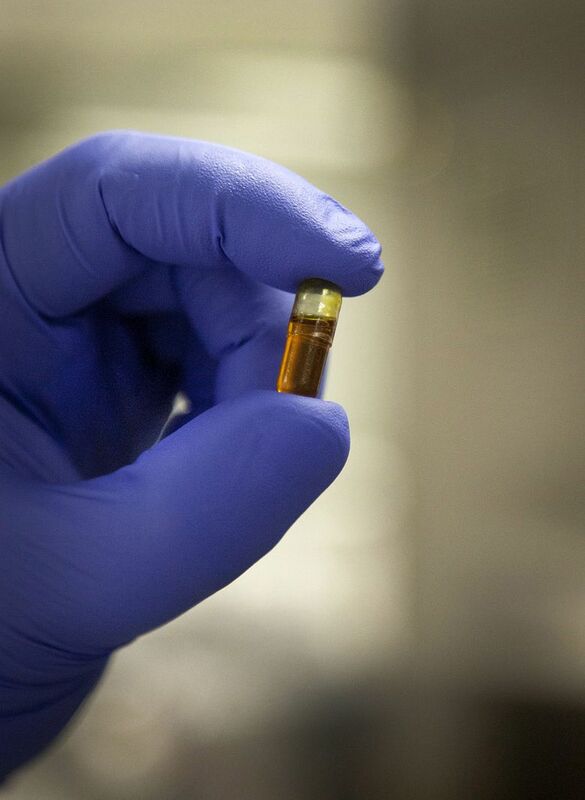 The sensor, which is about the size of a grain of sand and dissolves in the gastrointestinal tract, also tells doctors when a patient has ingested their medication. The information is compiled in a database that doctors can access from their devices. “You’d think for cancer treatment that patients would be pretty diligent, and that’s not always the case, for a variety of reasons,” he added. Despite the concerns, many experts have pointed out that the technology will help doctors ensure patients are taking their prescribed medication. Not taking medicine — or “medication nonadherence” in the health care world — is a “common and costly problem,” according to a study cited by the National Center for Biotechnology Information. “Approximately 30 percent to 50 percent of U.S. adults are not adherent to long-term medications leading to an estimated $100 billion in preventable costs annually,” according to the 2013 study. Comparing medication nonadherence to weight loss, NCBI researchers say the problem is more complex than it might seem and often has multiple complicating factors. Greeno agreed, pointing out that his patients aren’t always lying about their behavior. Sometimes older patients have trouble opening pill bottles. Other times, he said, they’re so fatigued and foggy that they struggle to adhere to a rigorous schedule that requires them to ingest multiple pills each day. And sometimes, he said, they struggle to deal with a medication’s side effects. Brenda Jans Darling, 45, has another reason she sometimes fails to take her chemotherapy medication on time: She’s a working mother of two juggling recovery with a daily onslaught of activities. What she finds most useful, however, is knowing she no longer needs to count her medication to ensure she hasn’t missed a dose at the end of a busy two-week medication cycle. Now when she forgets, she added, she gets an alert on her iPhone that says, “We have not received data from your 8 a.m. dose,” which she finds extremely useful. Darling said she isn’t worried about her doctors having access to an ever-growing amount of personal health information and believes that data will be used to combat the disease she’s spent the last two years battling. “I’m going to do whatever I can to advance cancer research so we can find a cure to our modern-day plague,” she said.